What will the weather be like in 3 weeks time? This may seem like a silly question, and whilst weather forecasts can’t tell you if it will be raining at lunchtime three weeks from today, they may be able to tell you whether in 3 weeks it’s likely to be wetter or colder than average for the time of year. Many national weather agencies now run operational monthly (or sub-seasonal) forecasting systems. These monthly forecasting systems fall between the traditional weather forecast and seasonal forecasts. All rely on good numerical models to predict the evolution of the atmosphere, and in the case of monthly and seasonal forecasts, the ocean, but the predictability comes from different parts of the system. In traditional weather forecasts the predictability resides in the atmosphere and the skill depends on a good knowledge of the current state of the atmosphere. In contrast, for seasonal timescales most of the predictability derives from the atmospheric response to slowly varying boundary conditions like sea-surface temperatures, sea ice or land surface conditions, so the skill depends on a good knowledge of the current state of these parts of the system and the exact state of the atmosphere at the initial time is relatively unimportant. Because at these long time ranges we can only make probabilistic forecasts, a large ensemble of forecasts to sample the uncertainty and the seasonal forecasts are presented either as the anomaly of the ensemble mean or relative probabilities of wet or dry conditions and warm or cold conditions compared to the climatological average for the time of year (Figure 1). 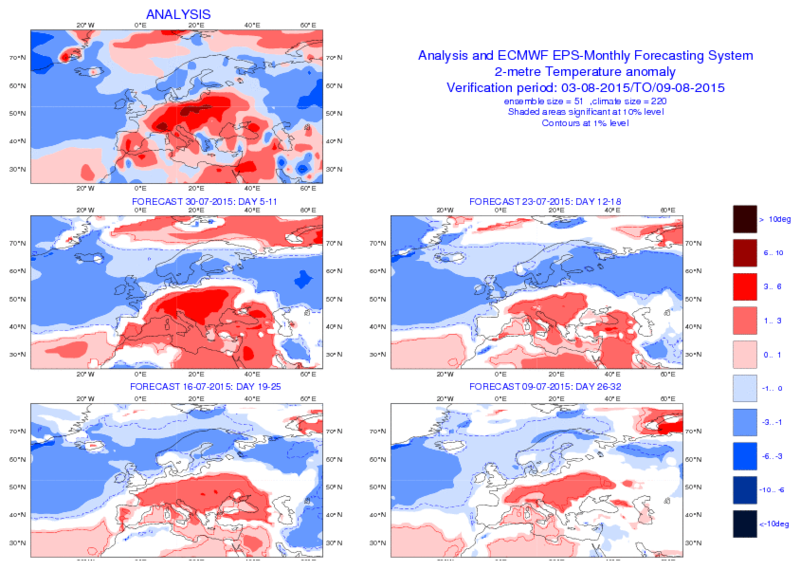 Monthly forecasts usually use a similar system to the seasonal forecasts and are often presented in the same way, but on these timescales there is significant predictability associated with the initial state of the atmosphere, particularly more slowly varying modes of atmospheric variability, as well as from the slowly varying boundary conditions. One important mode of atmospheric variability on these timescales is the Madden-Julian Oscillation (MJO). The MJO is characterized by an eastward moving envelope with regions of enhanced and suppressed convection (and precipitation) which propagates through the tropical Indian Ocean and West Pacific. Each MJO event lasts for between 30 and 60 days, and as well as modulating local weather the heating associated with the formation of precipitation can drive global circulation anomalies which modify extra-tropical conditions. For example, the probability of positive phases of the North Atlantic Oscillation, with a strong North Atlantic jet stream driving weather systems into the northern Europe, is increased around 10 days after the phase of the MJO with enhanced convection over the Eastern Indian Ocean. Monthly forecasts have a number of possible applications, but perhaps the most important is the potential for longer range forecasts of hazardous weather to give governments and NGOs more time to take action to mitigate the impact of the hazardous weather and plan for relief work. To evaluate the current skill of operational monthly forecasting systems and promote research to improve our understanding of the sources of predictability on these timescales, improve our operational prediction systems and to promote the use of monthly forecast products by decision makers in government and business, the World Meteorological Organization has recently launched a sub-seasonal to seasonal (S2S) prediction project. One important component of this project is the provision of a database of operational sub-seasonal forecasts from 12 operational centres around the world, which will provide a valuable resource for research into both the science of sub-seasonal forecasting and its utility for decision making. This entry was posted in Climate, Numerical modelling, Seasonal forecasting, Weather forecasting and tagged seasonal forecasts, Subseasonal-to-Seasonal Predictions. Bookmark the permalink.